Pick up is from Canadian Mattress Recycling in Delta (on Annacis Island) at the north end of the Alex Fraser bridge. Go to the ramp at loading door # 16 - 715 Eaton Way. This wood is perfect for all sorts of projects and for using as firewood. 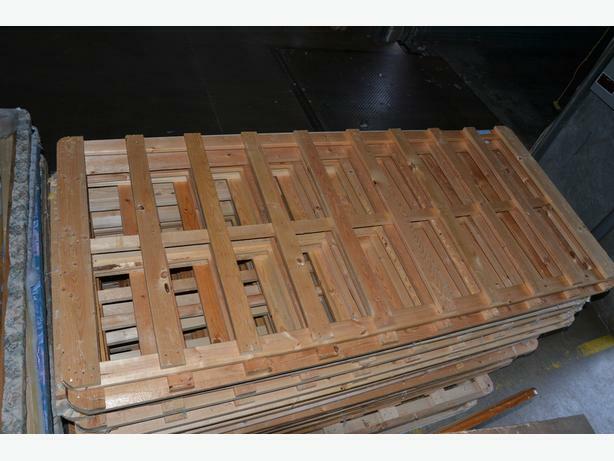 Dry, straight pieces from boxspring frames. No fabric attached. Unlimited amount. We have a never ending supply of this wood year-round. Perfect for building or fixing fences, benches, sheds, lattices, planter boxes, furniture, storage trunks, shelves/ shelving, garden beds, etc. The length of the wood is generally the length or width of a mattress (single, twin, double, or queen) and how it appears in the photo. That means it is usually about 2 meters long and as wide as various mattress sizes. It isn't that difficult to take apart (it's usually constructed with staples, not nails) but that can't be done at our location. The easiest way to transport the frames is in a pick-up truck and/or trailer, so please bring something with which to strap the wood in securely. Please also bring someone with you to help load the wood into your vehicle as we cannot help with that. Check out our website to learn more about us: canadianmattressrecycling.com .